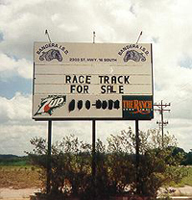 Among the business at a meeting of the Bandera ISD Board of Directors on Tuesday, April 13, was the consideration of bids to purchase the property that formerly housed Bandera Downs racetrack. The Bandera ISD voted 4-3 to accept a $1.206 million cash offer from Fort Worth businessman James R. Dunnagan. Dunnagan is also affiliated with Squaw Creek Downs in Willow Park, Texas. Representing Dunnagan at the meeting, Vicki Browning of Texas Rose Realty told the Bandera ISD that he plans to use the facility primarily for race horse training. She went on to say that Dunnagan will seek to restore the track to its former condition and hopes to install some retail and lodging facilities in the front of the property. Last November, the Bandera ISD had unanimously voted to accept developer Ron Kitchen’s $1.3 million bid for the property, but his bid was contingent on him finding a funding source. As of mid-February, his funding had not come through, and he made no bid during the fifth and most recent round of bidding.